PROPERTY developer Malaysia Land Properties Sdn Bhd (Mayland), which is set to open a second shopping centre by year-end, expects return on investment (ROI) in as early as five-and-a-half years. Typically, a mall in Malaysia could take up to 10 years to see ROI and at best, in seven years. Mayland, which owns and operates the Sri Hartamas Shopping Centre, is currently working on Cheras Sentral, the shopping complex which was previously Phoenix Plaza and is now undergoing a RM110 million transformation. The projected time to recoup investment in Cheras Sentral is commendable even though the investment is possibly only a fourth of what it would take to build an entirely new mall and the renovated mall will have less retail space. The previous mall, Phoenix Plaza opened in 1994 but closed in 2005. Mayland's retail general manager Michael Chee is confident that the company will be able to make the mall, which once failed, into an bustling spot. The mall, with 500,000 sq ft of net lettable area (NLA), anticipates 85 per cent occupancy on the opening day, which will be before Christmas this year. Rent at the malls is expected to be between RM4.50 and RM5.00 per sq ft.
Chee projects that the tenants within the mall will be able to rake in between RM150 million and RM200 million in sales in the first year of operations. In an interview with Business Times, Chee, who has 25 years of experience in the shopping complex scene, said the mall had previously failed due to the mismatch between the tenants and the surrounding demography. By taking this into consideration, as well as the needs of the growing Gen Y population, Chee feels he now has the right formula for the new upcoming mall. 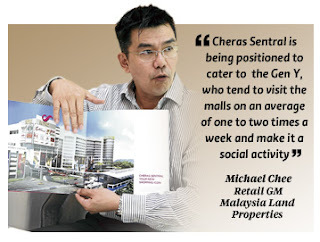 "Cheras Sentral is being positioned to cater to the Gen Y, who tend to visit the malls on an average of one to two times a week and make it a social activity," Chee said. He said that very often, people are judged by where they shop as it points to the status of the individual. Cheras Sentral will include coffee joints, leisure and entertainment elements as well as health and lifestyle. It will house a karaoke, eight screens cinema and Celebrity Fitness. The catchment for the mall include 1.6 million people within a 15 minutes drive, with 65 per cent of the average monthly household income at RM10,000. The anchor tenant at the mall is Jaya Grocer, that will occupy 24,000 sq ft and a 15,000-sq ft Chinese restaurant that can seat 1,000 people. Mayland, a company controlled by Tan Sri David Chiu, bought property in 2009 and took on the task of refurbishing it and adding a hotel and car parks. The entire investment is for RM160 million. The hotel, to be either a three or four-star category, will carry the group's hotel brand - Silka or Dorsett and will have about 300-odd rooms. The hotel is scheduled for opening at year-end or early next year. Chee said things could only get better when the MRT line is ready in three years.